A tummy tuck isn’t just about looking better, it can also restore weakened or separated abdominal muscles. Jason T. Arrington, MD, of Atlantic Plastic Surgery is a board-certified plastic surgeon with locations in Salisbury and Ocean City, Maryland. He expertly performs tummy tucks for women and men who want stronger, more toned abdomens, but aren’t able to get the results they want through diet and exercise. If you’re ready to take the first step toward a flatter tummy, call one of Dr. Arrington’s offices or make an appointment by clicking the scheduling button here on the website. A tummy tuck, also known as abdominoplasty, is a surgical procedure in which Dr. Arrington removes excess fat and skin from your abdomen. The procedure also restores weak abdominal muscles so you have a smoother, firmer, flatter abdomen. Although it’s not a replacement for diet and exercise, for those that are unable to get tighter abs on their own, a tummy tuck is the ideal solution to correct that problem area. What causes a sagging, loose tummy? What happens during a tummy tuck procedure? Abdominoplasty is not a simple procedure, but Dr. Arrington is an expert plastic surgeon with many years of experience in performing this type of surgery. Depending on the results you want to achieve, Dr. Arrington may need to make more than one incision in your abdomen and belly button. A full tummy tuck requires a horizontal incision below your belly button and above your pubic hairline. The size of this incision depends on how much excess skin you need to remove. After Dr. Arrington makes the incisions, he lifts your skin and repairs the muscles underneath. A second incision around your belly button is usually needed if you want to remove skin from your upper abs as well. Once Dr. Arrington removes all the excess skin, he sutures your remaining skin together and creates a new opening for your belly button. Since a tummy tuck is a very personalized treatment, Dr. Arrington discusses your condition and your goals and creates an individualized surgical plan that works best for you. 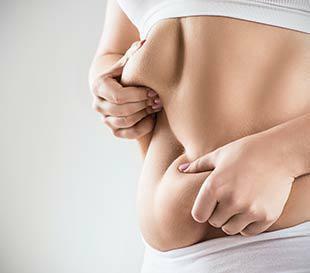 What can I expect from a tummy tuck? Once your body heals from the procedure, you’ll have a firmer, flatter stomach that’s contoured to match your body type and weight. Immediately after surgery, your abdomen will be wrapped in bandages and you may also wear an elastic compression garment to minimize swelling and support your abdominal muscles as they heal. Like with any major surgery, you’ll need time to heal, and should follow Dr. Arrington’s instructions during your recovery period. To find out if you’re a good candidate for a surgical tummy tuck, call or schedule an appointment online.